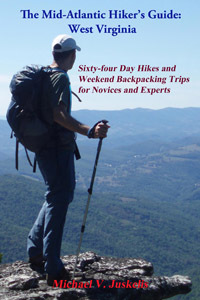 Welcome to a web site full of information on hiking in the Mid-Atlantic Region (PA, MD, VA and WV) ... topo maps, 3-D maps, elevation profiles, GPS data, directions, trail notes, photos.... everything you need to prepare for an excursion into the wilderness. Information for 318 hikes and over 3,657 trail miles are now available. 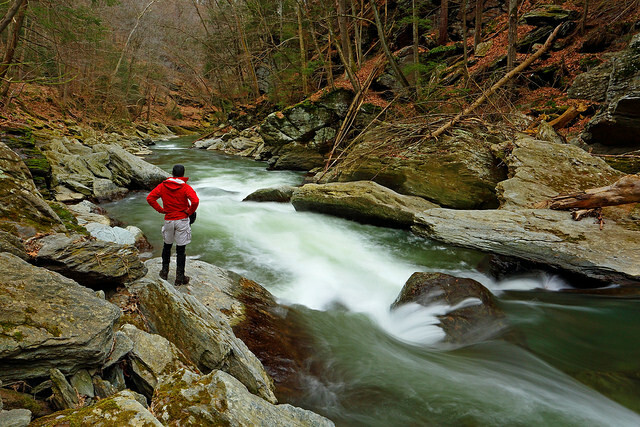 Venues such as, but not limited to, Shenandoah National Park/VA, George Washington and Jefferson National Forests, VA and WV, the Monongahela National Forest in WV, state forests throughout PA, Green Ridge State Forest in MD and regional, state, county and federal parks throughout the Mid-Atlantic region are represented. "Yet in the walks I take through nature in quest of truth and demonstration, I recognize a poetry in earth and sea and sky, ruled in their cycles of harmonious actions, deeper and more sublime than ever muse un- taught in science could inspire." William B. Rogers: First State Geologist of VA, First president of M.I.T. and namesake of Mt. Rogers, Va.
05/03/2014: "The Mid-Atlantic Hiker's Guide: Central Maryland" is now finished. It includes 45 day hikes from the shores of the Chesapeake Bay to Catoctin Mountain and from the Potomac River to the Mason-Dixon Line. The one hundred and eighty-four page book uses the same format as the West Virginia book (below). Orders are being taken. After two years of hard work my first book is finally finished - Orders are now being accepted: The Mid-Atlantic Hikers Guide: WV. I've teamed up with Scott Adams Enterprises to produce a two hundred and eighty-nine page manuscript complete with large topo maps, elevation profiles and waypoint tables, all keyed together to totally integrate the hiking experience. There are sixty-four hikes in all, ranging from a 2 mile flip-flop walk to visit the beautiful Sandstone Falls on the New River to 25+ mile, three day, strenuous forays into the wilderness areas of the Mountain State, and all other kinds of hikes in between. This portion of the website has been temporarily suspended. This is absolutely THE best area I've ever seen for Trilliums. The best spot I found was not directly along the AT, but instead on the blue blazed trail and fire road which looped up to the tower area - take the same fire road as mentioned in the directions to see the yellow lady slippers, and keep going up. There will be another blue blazed trail on your left which says "AT .25 miles," take that trail and be amazed. By the way, the yellow lady slippers are still there, there were several on the left side of the road next to a small boulder as described, and I found another one on the right side of the road a little further up. During my visit I'd say that the Trillium were at about peak, with some of them still white and others becoming pink and dark pink already. The Showy Orchis were mostly still buds. I encountered several other hikers who were out to see the flowers, and one family who said that they come here each year. I think I'll be doing the same from now on, next time I'll start early and do the entire loop. Outing Critique: I went out on a solo overnight hike on the LHHT and planned to make it from mile 0 to mile 11.5 and turn around and camp at the Ohiopyle (mile 6.5) shelters. It was warm for late April, with high temps near 80. The leaves were just starting to come in so the sun was very hot too! I got on the trail later than I had hoped and had to turn around early (mile 8) to make it to camp in time. I set up my hammock and had a nice evening around the fire in the shelter. The shelter came in handy the next morning as a brief heavy rain came through while I was cooking breakfast. There were a number of spectacular views and overall a beautiful place to hike! The elevation change was surprising for PA, don't underestimate the uphill section between miles 5 and 8. The trail is well-worn, but I didn't see that many people out there. Trains do run through the main gorge, so the occasional rumbling is heard even at the Ohiopyle shelters. The trail is rocky in many places and in fairly good shape with some springs running down through it making a little mud. However, all of the streams and runs are bridged, which is really nice to have. Specific to when I was out there, there were a couple larger downed trees that could be stepped over rather easily. There were a number of vines that were in the trail space at the but nothing unavoidable. All bridges were in good condition and all the shelters seemed to be in good condition too. I did not check the pump water at the shelters, as it needs filtered anyway, the cool creek water seemed like a great choice as it was closer to my shelter. Outing Critique: My husband and I hiked this as a 1-night backpack. We started out from the parking area at Lake Perez going the direction described in the trail notes. The trails within the S.V.R.A. were blazed with different symbols than described (I think it was yellow stick people instead of yellow arrows, or some thing like that) but were extremely easy to follow regardless. We decided to dry camp on the ridge of Tussey Mountain, at the site marked 2.03 miles into Jackson trail, to even out the mileage for each day. We planned to fill up on water from the stream before the climb, but it was either dry or farther from the trail than we thought. Luckily we came across a trickle, although our water pump broke and we had to carry dirty water to camp and boil it instead. The climb up to the ridge was very steep but not too long, and the ridge was extremely rocky, as advertised. I'm pretty sure we stayed at the camp site described as hidden in the hemlocks, but we also may have missed that particular site, because the one we found was definitely not hidden. There were 3 fire rings and multiple spots you could put a tent, but it looks like it is a popular teen/college hangout based on the trash, broken glass, and obvious cutting of standing trees for firewood--we were pretty close to Rte 26 so I think a lot of people just walk in from the road. There were a few potential spots we could have stopped prior to this, but not many due to the rocks. Even so, the camp location was amazing and we were able to see the sunset, stars, moon, and sunrise all from the pair of overlooks. There was a burn ban, so we brought our stove to the overlooks for dinner and breakfast with a view instead of cooking on the fire. On day 2 we completed the loop. The descent and ascent were, again, very steep but having rock and log steps helped. Overall, we had a fantastic trip--highly recommend this one! Outing Critique: Did this as a two night trip, starting at sunset Friday and hiking out noon Sunday. Worked great as a first of the season backpacking trip, as well as an introduction to backpacking for two of our companions. First night we hiked to the base of the first steep climb and made camp an appropriate distance off the trail. Second day started with that climb, then a very pleasant mostly level hike along the ridge. This track lacks great vistas, but otherwise has some interesting passages through the old coal mine(s?) area. Second night spent north of the resevoir. Downsides of this hike are the lack of vistas and the hike out includes a rather large portion on a frequented walking and biking trail p, which isn't a great backpacking experience. Upsides were some interesting paths along the ridge and a very pleasant hike along the resevoir. Overall I'd recommend this as a solid 1 night, 2 day hike, or 2 night, 2.5 day hike as we did. Outing Critique: A beautiful hike on a beautiful day! The bluebells were astounding along the river. Just SO many! The trail intersections are all well marked. Do not ignore traditional blaze turn signals (for new hikers: one blaze above another, turn in the direction the upper blaze is on), or you will miss the turn where the yellow trail cuts away from the river. A very clearly defined trail continues straight beyond that point, just after a stream crossing, but turning right is the right thing to do there. Just follow the blazes! The only reason I did not give this hike a 5 is because for the last half mile or so on the pink trail the noise from Bel Air road is pretty pronounced. Maybe taking the blue trail all the way, which cuts a small amount of distance, would keep you farther away from that. Something to consider. Overall, highly recommended and also recommend combining with Lost Pond Circuit. Did both today and thoroughly enjoyed myself. Outing Critique: Just completed this hike a few days ago, I also did it in 2 days/1 night, although when I set out I had planned on 3 days / 2 nights - but decided to push harder with some nasty weather moving in. Grindstone Campground was closed so I parked in the small lot right across from the Mt Rogers Trail Head. My vehicle was fine when I came back, but this parking area is very close to the road so be wary. Most of the elevation gain is experienced in the first few miles, and the views after about 4 or 5 miles are well worth it. I would classify this as an easy to moderate hike. The ponies were very cool, and it was very windy. Starting at the Boundary in the Graves Mill Parking Area, I completed this 13.3 mile loop hike. I followed the Rapidan River (Graves Mill) and Staunton River trails to the Fork Mountain Road. I took the road to the Sag where I picked up the Jones Mountain trail which I took to Bear Church Rock and then back to the Staunton River Trail. I got a late start (noon) hiking to the sound of continuous thunder (which luckily never materialized into rain) in 90 degree heat barely making it off the mountain in daylight. In what should have been miserable conditions I had a great time and would highly recommend this hike. Pros: I don’t like to throw around phrases like hidden gem, but this was one of the best hikes I have done in SNP. The Rapidan and Staunton rivers were beautiful to watch transition from flowing rivers at the start to a cascading brook at the top. For the 6+ miles from the Jones Mountain trail junction to the Sag to Bear Church Rock I did not see a single person (maybe they were smart enough to not hike in these conditions). This part of the trail, while easy to follow, did have portions where it felt like you were the first person hiking them in a long time. The rock formations in and around Bear Church Rock were typical of SNP (in a good way). Cons: SPIDERS. Seriously, there was a web across the trail every 10 feet once I was past the Bear Church Rock (Jones MTN TR) turn off. This hike also has a ton of elevation so be prepared for ~6 miles of steady (but never steep) uphill. Watch the video of this hike. Outing Critique: I hiked this on a Friday in late September and had the park virtually to myself. I enjoyed the multiple overlooks and did some rock scrambling on Chimney Rock. I accidentally took a wrong turn and added a two mile down and back to Camp Airy (the trail is not on the Park Service map). Pros: Multiple overlooks, well maintained trails, good signage. I have always enjoyed Cunningham Falls so that is a good way to top off a day in the woods. Cons: Several portions of the trail are wide smooth gravel. I guess one person’s Pro is another’s Con. I thought it detracted from the natural experience. It seems funny that they don’t blaze the trails to keep them more natural but are willing to truck in tons of gravel (note, the gravel tends to only be around the more popular places). The road noise off of 77 on the south side and 550 (to a lesser extent) on the north side was ever-present (mostly motorcycles). The hike between Cunningham Falls, the Visitor Center, and the Park HQ is within sight of the 77 which really detracted from the experience. Outing Critique: I hiked the Riprap trail clockwise starting at the Riprap trailhead. I opted to do the “boring” AT part first and work up a sweat before hitting the swimming hole. The AT lived up to expectations with only one slight overlook providing a preview of the mountain that would need to be climbed at the end of the hike. The Wildcat Ridge Trail was an easy descent into the hollow and had a few overlooks. The last mile follows a small stream until the junction with the Riprap trail. From there the last 3ish miles were all uphill, although there was only one steep section. The swimming hole was okay. What it lacked in size it made up for in coldness. The 20’ waterfall was not much more than a trickle when I was there but the rock formations in that section were still pretty. The vistas in and around Chimney Rock were typical and you could get the same view from just about any of the west facing overlooks on Skyline drive. Overall it was not a bad hike, but there was nothing about it that would make me hike it again. The AT and Wildcat trails do not add much value to this hike so you could hit all of the highlights by hiking counterclockwise out and back to Chimney Rock (or possibly down to the swimming hole). Outing Critique: I attempted this hike with my husband and his aunt. She hasn't done a lot of backpacking, especially recently, so we thought the relatively low and flexible mileage on this one would make it a good choice. However, the first section of the trail (up until you reach hemlock road for the first time) has clearly not been maintained for many years. There were countless downed trees across the trail and areas where we had to search for blazes when the trail seemed to just disappear. That section, plus the steep descent on rocks covered with slippery fallen leaves once we reached the Tuscarora trail, put us so far behind schedule (despite having very generous time allowances) that we ended up camping at the shelter on the Tuscarora. It was a great shelter, with a fantastic fireplace that kept us warm in the chilly night & morning air, water source, and nearby privy. On day 2 we had way too much ground of unknown quality to cover so we decided to follow the Perry & Twig trails to hemlock road, then just walk on the road back to the car. Overall it was disappointing, but I would attempt it again, bypassing the initial section by walking on hemlock road to reach the Tuscarora trail. Seems like it would be a nice hike if we could have completed it, so my ranking might be unfairly low..